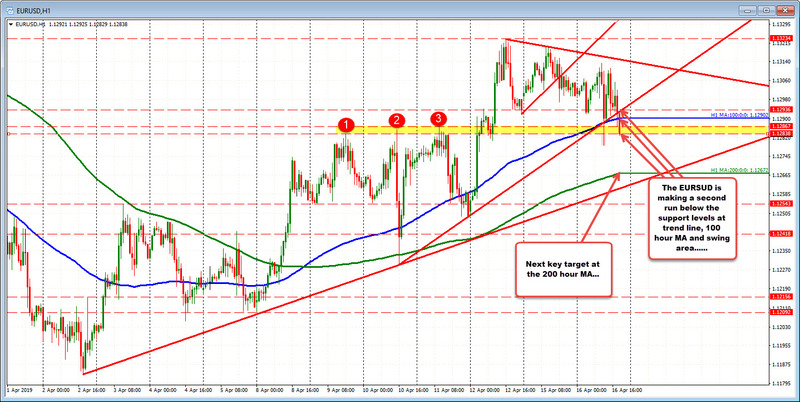 The EURUSD is making a second run below support levels today. Earlier in the day, the pair fell below a trend line and 100 hour MA AND a swing area in the 1.1284-867 area. That break failed. The price moved higher. Now, the pair is going after the same levels. The trend line is at 1.1293. The 100 hour MA is at 1.1290. The swing area is at 1.12838 to 1.12867. The low just reached 1.12829. Traders will now use the 1.1290 level as risk on shorts. Stay below is more bearish. Move above and the sellers who have hope for more downside momentum (200 hour MA at 1.1267 is a target), could run out of patience, and buy again. The range in the EURUSD is only 35 pips today. That is 65% of the normal 53 pips seen over the last month of trading. There is room to roam if the sellers can keep pushing.